Sir:—I received with particular satisfaction, and imparted to Congress, the communication made by the President’s letter of the 20th of June last in the name of the National Assembly of France. So peculiar and so signal an expression of the esteem of that respectable body for a citizen of the United States, whose eminent and patriotic services are indelibly engraved on the minds of his countrymen, cannot fail to be appreciated by them as it ought to be. On my part, I assure you, sir, that I am sensible of all its value. The circumstances which, under the patronage of a monarch who has proved himself to be the friend of the people over whom he reigns, have promised the blessings of liberty to the French nation, could not have been uninteresting to the free citizens of the United States, especially when they recollected the dispositions which were manifested by the individuals as well as by the government of that nation toward their still recent exertions in support of their own rights. It is with real pleasure, sir, that I embrace the opportunity now afforded me of testifying, through you, to the National Assembly, the sincere, cordial, and earnest wish I entertain, that their labors may speedily issue in the firm establishment of a constitution which, by wisely conciliating the indispensable principles of public order with the enjoyment and exercise of the essential rights of man, shall perpetuate the freedom and happiness of the people of France. The impressions naturally produced by similarity of political sentiment are justly to be regarded as causes of national sympathy, calculated to confirm the amicable ties which may otherwise subsist between nations. This reflection, independent of its more particular reference, must dispose every benevolent mind to unite in the wish that a general diffusion of the true principles of liberty, assimilating as well as ameliorating the condition of mankind, and fostering the maxims of an ingenuous and virtuous policy, may tend to strengthen the fraternity of the human race, to assuage the jealousies and animosities of its various subdivisions, and to convince them more and more that their true interest and felicity will best be promoted by mutual goodwill and universal harmony. The friendship to which the President alludes in the close of his letter, has caused me to perceive with particular pleasure that one who had endeared himself to this country by an ardent zeal and by useful efforts in the cause of liberty has, by the same title, acquired the confidence and affection of his own. May it ever be his chief aim to continue to be beloved, as one of her most virtuous and most faithful citizens. I beg you to accept my acknowledgments for the sentiments in the same letter, which relate more particularly to myself, and at the same time to be assured of the most perfect consideration on the part of, etc. 1 This draft of a reply to the communication of the French Assembly on the death of Franklin was adopted verbatim by Washington and sent to France.—Writings of Washington, ⅹ., 133. 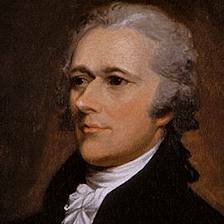 This entry was posted on October 9, 2013 at 2:31 pm and is filed under Cabinet Paper, Foreign Affairs, The Works of Alexander Hamilton, Thomas Jefferson. You can follow any responses to this entry through the RSS 2.0 feed. You can leave a response, or trackback from your own site.